Ben loved drawing more than anything else in the world (with the possible exception of riding his bicycle). He drew boats as well as bicycles, sharks and spaceships. But most of all he loved drawing people. When Ben loses his sketchbook his world is turned upside down. Who will find it? And how will they react? 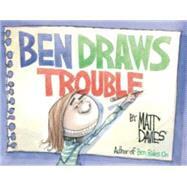 Find out in this worthy successor to Pulitzer Prize-winning cartoonist Matt Davies's first picture book, Ben Rides On. Matt Davies was the recipient of the 2004 Pulitzer Prize for editorial cartoons, the inaugural 2004 Herblock Prize, and the 2001 Robert F. Kennedy Journalism Award. He and his wife, Lucy, live in Wilton, Connecticut, with their three children. His first book, Ben Rides On, also about Ben Lukin, was called a "great amusement for the bold and timid alike," in a starred review from Kirkus, as well as "exceptional and exceptionally likable" by School Library Journal.